One in three children in England does fewer than 30 minutes of physical activity a day – half the amount recommended by government guidelines, a report by Sport England suggests. Girls are less likely to be as active as boys, with 13 to 16-year-olds the least active age group. The online survey of 130,000 five to 16-year-olds found children from poorer families did least exercise. Sports Minister Mims Davies said the figures were “simply unacceptable”. “We know that an active child is a happier child and efforts must be stepped up to encourage young people to live healthy, active lives,” she said. Guidelines from the chief medical officer say that children and young people should take part in sport and physical activity for at least 60 minutes every day. This should be made up of 30 minutes activity during the school day and 30 minutes outside school. But the 2017-18 survey suggests only 28% of children achieve that amount in school – and only 22% after school. Being active includes sporting activities, active play, walking, fitness activities, dance and using a scooter. 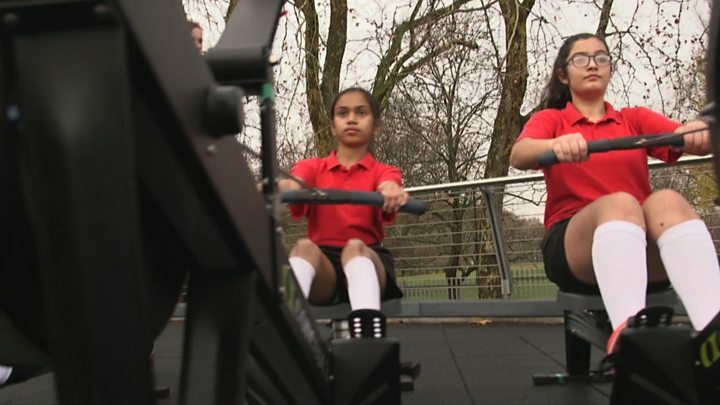 Pupils at Mossbourne Community Academy in Hackney, London, are learning to row through a programme run by London Youth Rowing to open up the sport to more young people. “It’s a really good stress reliever, especially when there are exams,” says one pupil. “You find things out about yourself you didn’t know were there,” says another. Rowing coach Oliver James believes a culture of sport can be created. “It becomes an expectation that doing sport is just something that young people do,” he says. There is evidence that ethnic background and family earnings also have an impact on activity levels. Girls from Asian and black backgrounds are less active than children from other communities while 86% of children from the highest-earning families can swim 25m unaided, compared to only 42% from families earning the least. The type of activities children do changes as they get older. Playing tag or climbing in a playground are popular among younger age groups, but this gives way to team sports which become the most popular activity by years 7-8 at school. Tim Hollingsworth, chief executive at Sport England, said he wanted to see a national focus on the health and wellbeing of children. “Parents, schools, the sport and leisure industry and government all have a role to play in addressing and increasing childhood activity. This research is the first of its kind anywhere in the world and is a big wake-up call for all of us. He said listening to young people and what they want was the best starting point. Sport England will be releasing a second report, due in March 2019, highlighting children’s attitudes to sport and physical activity.